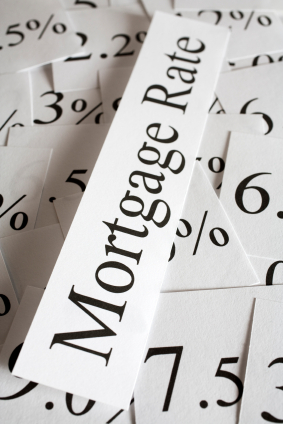 Dave The Mortgage Broker > Monday Morning Interest Rate Updates > Fixed- Versus Variable-Rate Mortgages: Is the Reward Worth the Risk? Our economic data have continued to weaken. Our GDP growth rate came in at only 0.4% on an annualized basis in the fourth quarter of 2018, well below the consensus call of 1.2%. Our overall inflation rate slowed sharply to 1.4% in January, and the BoC’s three core sub-measures of inflation have also been trending downwards of late. Job growth has been stronger than expected, but while average wage growth recently perked up a little, it is still barely outpacing overall inflation. More importantly, weaker-than-expected business investment and exports portend softer employment data in the months ahead. The “decidedly data dependent” BoC has sounded much more dovish of late, and given that, now seems like a good time to revisit the age-old comparison of a fixed rate versus a variable rate using our current backdrop. Thus far, the BoC has only conceded that it faces “increased uncertainty about the timing of future rate increases” and that it will need time to properly assess the factors that are causing our growth to slow. That language implies only a pause before the Bank resumes hiking. But experienced market watchers know that the BoC tends to shift its policy-rate view incrementally, and that’s why they are interpreting its increasingly dovish language as a precursor to eventual rate cuts. If choosing a variable-rate mortgage sounds like a slam dunk in the current environment, it’s not. In addition to weighing individual factors such as the ability to manage payment increases and one’s psychological tolerance for floating-rate risk, today’s borrower must also be willing to start out with a variable rate that isn’t much lower than its fixed-rate equivalent. The spread between variable and fixed rates is now unusually narrow because the factors that have made the BoC more dovish have also pushed down Government of Canada (GoC) five-year bond yields, which our five-year fixed-rate mortgages are priced on. To wit, the five-year GoC bond yield was at 2.39% when the BoC completed its last rate rise on October 24, 2018, and it closed at 1.60% last Friday. So there’s the rub for anyone making the fixed- versus variable-rate call today. If you choose a variable rate, it isn’t likely to rise over the next twelve to eighteen months, and it may actually fall. But five years is a long time, and the farther out you go, the harder it is to predict what will happen to mortgage rates with any degree of accuracy because there are just too many factors that come in to play. Our federal government might respond to sluggish economic conditions with ill-advised fiscal stimuli that exacerbate inflationary pressures (especially in an election year). Sector-specific labour shortages could fuel price increases even in a low-growth environment. Geopolitical tensions could cause a spike in energy prices. A sovereign debt crisis (i.e. in the EU) could lead investors to re-price bond-market risk premiums worldwide. A plunging Loonie could fuel a sharp increase in import prices. The BoC has been very clear that its sole mandate is to keep inflation low and stable, and furthermore, that it will adhere to that mandate even if doing so triggers negative side effects across other parts of our economy. If any of the five scenarios outlined above (and/or others not listed) were to come to fruition and the BoC were to raise its policy rate in response, today’s variable-rate borrowers wouldn’t have much buffer to work with. Conversely, borrowers who opt for a five-year fixed rate today need pay only a very small premium in exchange for the security of knowing that their payment won’t change for the next five years. 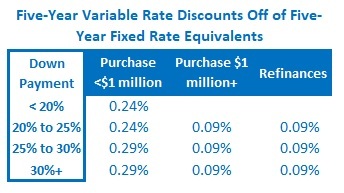 The Bottom Line: I think that five-year variable rates will likely prove cheaper than their fixed-rate equivalents over the next five years. That said, I think the saving won’t be as dramatic as it has been in years past, and if borrowers want to guard against wild-card scenarios like the ones I have outlined above, today’s five-year fixed-rate premiums are miniscule by any historical comparison.